The Cackling Hen: My Spanish Romantic Comedy, Plucked. My Spanish Romantic Comedy, Plucked. One small beauty of still job hunting for the perfect, long-term career is that there's no boss to say, "No, you can't go on a 2 1/2 week trip." So I did. We won't discuss the financial downside, since this is The Cackling, not Crying, Hen. When 2 sets of friends planned their weddings 10 days apart at different parts of the globe, I knew I'd be at both somehow. The first wedding would be in Spain, and I was thrilled to have an excuse to return to one of my favorite countries. And it would be embarrassing to travel all the way to Spain for a weekend, so I booked a solid week for celebration, frolicking, and self-discovery. After the wedding festivities, I'd have a few days most likely to myself, just like a romantic comedy. I'm an independent only child; this was going to be great! Who knew what shenanigans I'd find and who I'd meet? 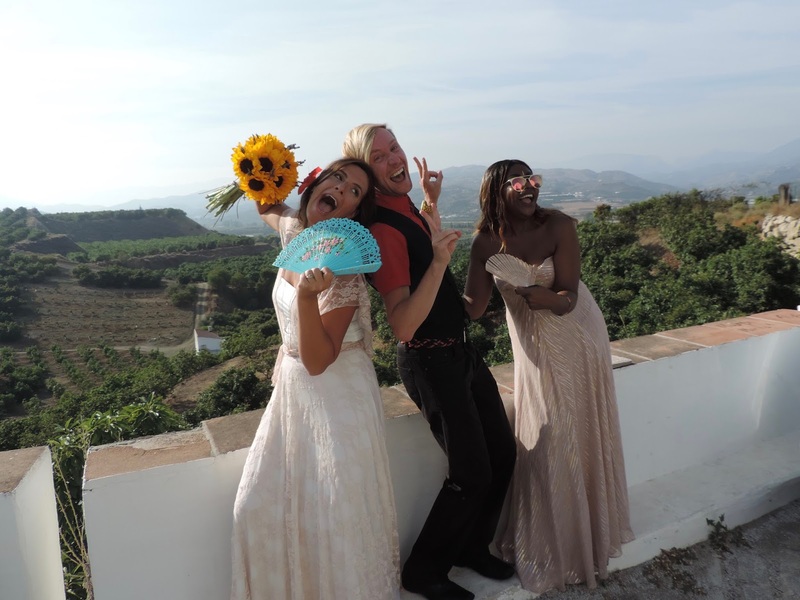 Thankfully, a few friends and the bride lingered in Malaga as well to keep the fun going, because it turns out that I'm not a movie character who finds life and love alone in Europe. I had a few romanticized ideas about flying solo in Spain that didn't come to life. Maybe some movies aren't true after all. Idea: In the days after the wedding, I'd keep exploring the bar and restaurant scene. I'd quickly make new, local friends who'd love me, and we'd laugh and dance the night away. Reality: I don't talk to strangers unless they approach me, and I'm intimidated by groups when I'm solo. This "self-discovery" made my romantic idea a bit difficult. Only servers approached me, and even that took some effort. And when I asked my favorite server to dance, he asked me to leave since he was "working" and it was "2 p.m."
Idea: There are endless sights to explore in Malaga! I'll have endless entertainment; a week won't even be enough. Sightseeing is easier alone anyway, allowing me to go at my own pace. Reality: I saw all the amazing sights and landmarks I wanted to see, some multiple times. The Roman Theatre is awe-inspiring in the heart of the city, but after walking past it 10 more times throughout the week, it became some old steps in the way of getting to the bar. The only sight I missed was the giant ferris wheel. I'll do it with friends next time, but since I hate heights, enclosed spaces, strangers, and enclosed spaces with strangers, it seemed like a terrible activity. Idea: I'd be easily entertained on my down time, writing my memoirs in my cozy apartment while drinking coffee or beer. When I finished my novel, I'd read numerous books on my Kindle, either at a cute street cafe or on top of a castle. This might even lead to someone interesting approaching me! No time for writing; I'm busy. Reality: I didn't write one word and I never turned on my Kindle. I would enjoy my morning coffee in my apartment, but then I'd get antsy to go outside and seize the day. Once I started seizing the day, I'd end up at my favorite cafe with poor service and wifi so I could put pictures of my coffee on Instagram. The interesting/only bird who approached me was my server. At least he brought beer. Idea: This modern art museum will be inspiring and take up my entire day. Reality: It's only 3 p.m., now what? And now I'm kind of disturbed. 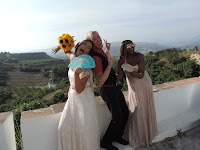 Some jokes aside, my time in Spain was all the fun and fiesta, and after a solid week, I was ready to flap on to the next plane and next magical wedding. Maybe one day I'll learn that life isn't like the movies, although the 2 weddings were even better than Hollywood could create. "Bon Jour! Where am I?"